PSNews – The Ha Giang Provincial Police on last Sartuday cooperated with organizations and individuals to visit, encourage and present gifts to households hit by the recent flooding. A delegation of the Ministry of Public Security (MPS) led by Senior Lieutenant General Nguyen Van Thanh, Member of the Central Party Committee, Deputy Minister of Public Security on July 4 visited and worked with the Police Station of Vi Xuyen district, Ha Giang. PSNews - The Ha Giang Provincial Steering Committee for Prevention and Combat against Crimes and Social Evils and the Movement "All people protecting national security" on April held a conference of its Standing Office to review task performance of its Standing Office in the first quarter of 2018, and provide some training for responsible officials from involved provincial and district-level agencies and organizations. PSNews-Ha Giang Police donated a house of gratitude to a needy police officer of the Bac Me District Police. PSNews – Senior Lieutenant General Nguyen Van Thanh, Deputy Minister of Public Security had a working session with the Ha Giang Provincial Police on May 29. 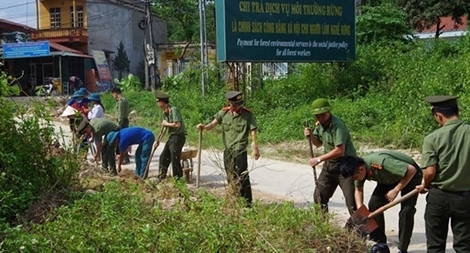 PSNews – The Ha Giang Police force on March 3rd started the construction of an overflow bridge across a stream nearby Bo Lam hamlet, Na Khuong commune, Quang Binh district to facilitate travel of local people in the remote area.